A small exploratory dig was done on rough pasture land at the rear of houses in Avalanche Road used for keeping horses. 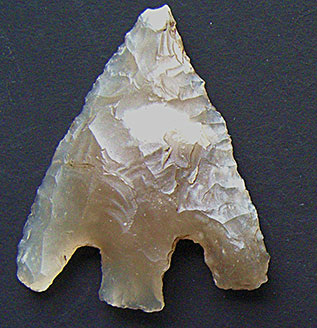 Finds included a particularly fine tanged arrow head beautifully formed from flint. Picture below is not the actual artefact which unfortunately was lost, but in all other respects is identical. Members of the Association for Portland Archaeology, led by Denene Reilly, carried out an excavation between June and August in 2001. The aim of the excavation was to discover if any archaeological evidence remained associated with a burial which was excavated in the 1970’s when new housing was constructed to the rear of the existing properties in Avalanche Road. The excavation was also to provide practice and experience in excavation techniques. One shard of Iron Age pottery was also excavated in association with two fragments of possibly burnt daub. Fig 3) Some metal finds were also excavated from these layers including a Iron brooch pin and a Bronze/Alloy stud and catch possibly from a wooden box. (Fig. 4). Layer Three was a natural deposit of a solid yellow/green clay laying over a natural salt bed. No features or structural evidence was excavated in the trench but the number of pottery shards indicates the presence of a Roman settlement on Avalanche Road.